Well… nearly two years later and I’m gonna try to wrap up my cross-country trip! If you’ll recall, we left off at Canyonlands, one of my favorite parks of my whole journey. This involved some backtracking, past Moab. I went past my old campground on the Colorado River, where there was construction that reduced traffic to a single lane. While sitting in traffic, I realized: I knew the area looked familiar! 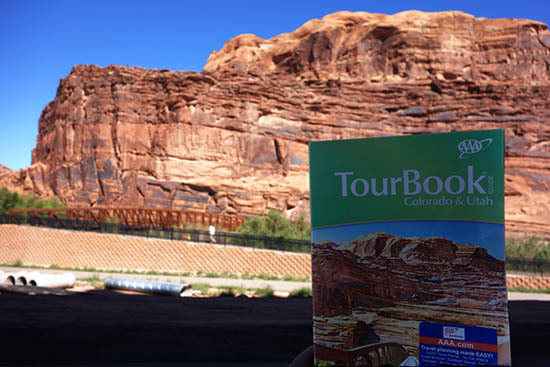 This little sideroad near Moab was the front of my regional guidebook. 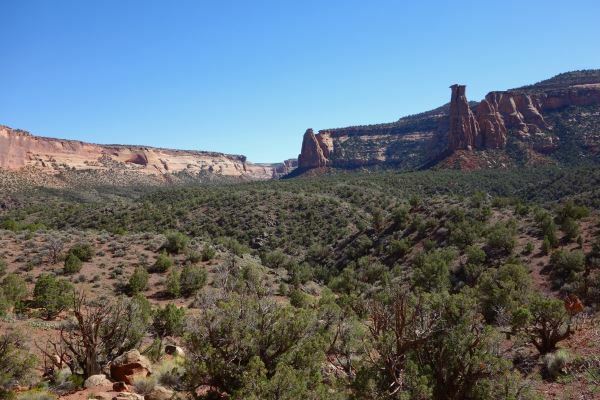 Just outside the Utah border is another park: Colorado National Monument. I didn’t know a whole lot about it – but it was right off the highway. I stopped for a hike, doing a loop through the monument. 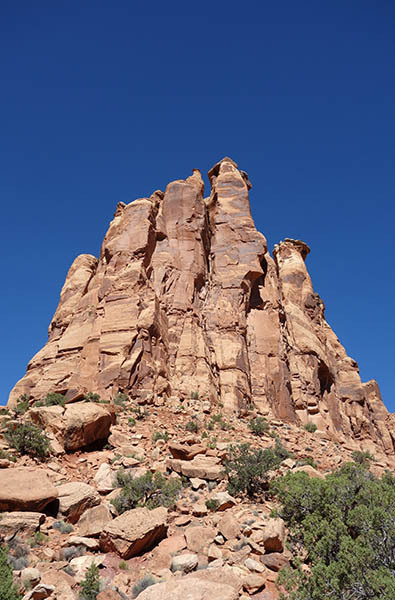 This monument is mostly known for its large central canyon, ‘Monument Canyon’ which is mostly red rock and scrub – although there’s also striking rock pillars (I don’t know if they’re technically considered hoodoos). 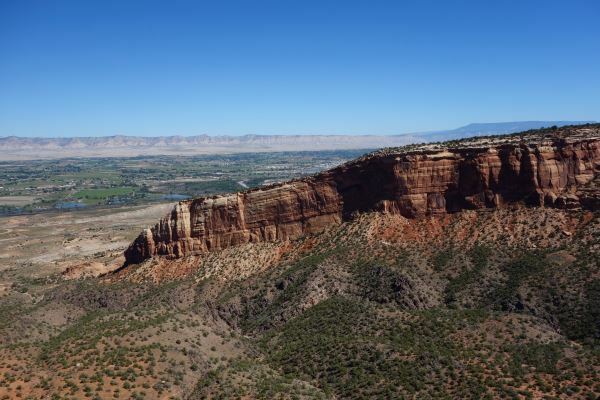 The valley opens up above Fruita, Colorado, a town in a sort of desert oasis – after this city, the landscape started to change more dramatically into the Rocky Mountains. The nearest city is Grand Junction, not far away. I was just passing through and wanted to stop for my daily hike – though this was quite a nice little monument and I’d love to return. 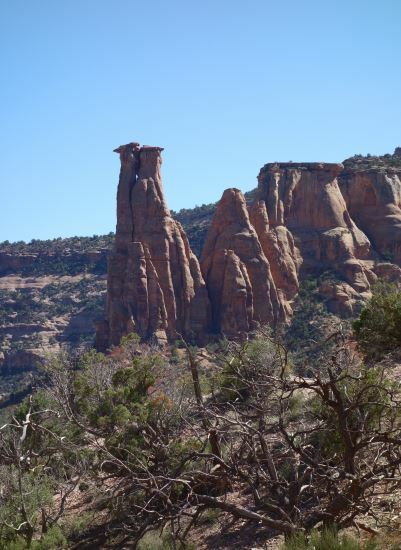 There’s a few major pillars within the monument: the ‘Kissing Couple,’ ‘Independence Monument’ and ‘Coke Ovens.’ I enjoyed the hike, down into the canyon, around a bend, and then up to an overlook above Fruita. However, the experience was marred by the dirt bike tracks visible in many places. The sand in these parks is delicate and composed of a lot of micro-organisms. It’s a living thing, in a way, and the dirt bike tracks last a very long time. Nonetheless, I was excited to see another animal that I hadn’t gotten much of a look at on my trip: bighorn sheep. There was a herd of them at the end of the trail that proved to be a nice send off as I hopped back in the van. 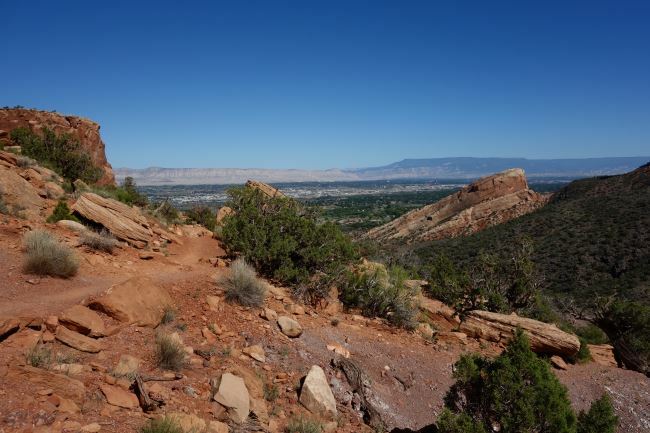 The trail – moderate intensity. But man was it hot! This entry was posted in Periodic Update on May 5, 2015 by rob.